All songs by Donovan P. Leitch. · Donovan: vocals, acoustic guitar, mouth harp. · John Cameron: horn arrangements, string arrangements. · Chris Norman: background vocals. · Alan Silson: background vocals. · Terry Uttley: background vocals. · The last album that Donovan made under the label of Epic Records was Slow Down World, in 1976. It achieved poor success and the contract was not renewed. 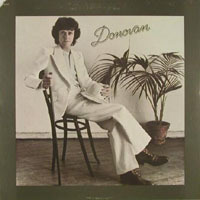 For his new album, Donovan contacted his old producer, Mickie Most, who had created Rak Records in the UK. The album was distributed in the US by Arista Records. · This album features a contemporary sound, without the beautiful ballads that appeared in previous albums (except for Maya's Dance). Despite these changes the album did not chart neither in the US nor in the UK and Donovan didn't release another album in the US until 1984. · The three background singers (Chris Norman, Alan Silson and Terry Uttley) were members of the band Smokie, who had great success in the 70's. · The photography was taken by Gered Mankowitz and the front cover was designed and produced by Cream. · The International Man is listed on the back cover as International Man. · Local Boy Chops Wood was dedicated to Brian Jones (and, eventually, other musicians who died tragically during those years). · Astral Angel was partly dedicated to Gram Parsons.